The aroma of garlic and ginger filled the air of our hostel kitchen as it sizzled in this stir-fry. By far better than any stir-fry we’ve had on the road in South America, this recipe is a go-to when we want something scrumptious for diner. We use quite a bit of ginger in this recipe, if you don’t like ginger, you can omit it. Use more garlic in its place. Combine all sauce ingredients in small dish and mix well. Set aside while you prepare the rest of the stir-fry. 1) Cook your rice while you prepare the vegetables and protein. 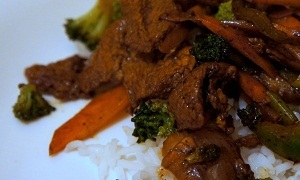 2) Cut beef into thin slices (as thin as possible) and place in dish with soy sauce and wine to marinate. 4) Heat pan on high heat and add 2 tablespoons of oil. Allow oil to heat up for 1-2 minutes. 5) Once oil is hot, add the protein, cook it till it’s almost done. For beef this should only 1-2 minutes, for shrimp until they are pink about 1 minute. Remove protein from pan and place on a plate while you stir-fry the vegetables. 6) After removing the protein, allow pan to heat up again, and add more oil if necessary. Add vegetables and allow to cook for 2 minutes, until they are still crispy, but a bit tender. 8) Add protein to stir-fry and let all ingredients warm together for 1-2 minutes. Serve immediately over rice! Enjoy! - Separate vegetables by cooking times. Carrots will take the longest, followed by onions, then green peppers, etc. This will make for the best stir-fry. All the vegetables crisp, but still tender. - If using broccoli, boil it for 2-3 minutes beforehand to cook it before stir-frying. If you have a microwave, put the broccoli and a tablespoon or two of water into a covered dish and microwave for 2 minutes.